I was feeling very insecure about my inks. I hit up Steve Mitchell (I don’t remember how I got his phone #) for guidance. During this period, Steve Mitchell, Mike Vosburg, Shawn McManus, and some other comic artists were splitting the rent on a small house in Montrose, California, for use as a joint studio. Steve agreed to look at my work-in-progress, and Mike Vosburg came along for the ride. During the year of 1993 that I was working on "The Mark in America", I would meet with Steve and Mike Vosburg for lunch every month so that the two of them could graciously critique my efforts. Their professional expertise was invaluable. 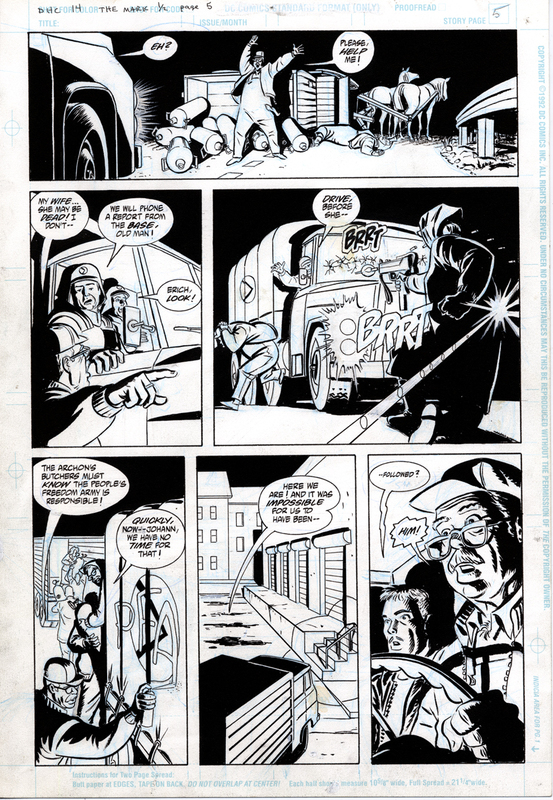 This is page #5 from Dark Horse Comics #14, “The Mark: Taking Back the Streets”, written by Mike Barr, drawn by Brad Rader, published in November, 1993.